In the first of our safari camp stories from Garonga, I’m going to tell you about the rarest of the rare, the world’s most trafficked animal and the veritable golden snitch of the safari-quidditch world (more Harry Potter lingo to follow). That’s right, we’re talking about the pangolin. Now as big denouements go, I appreciate that this might have just fallen a little flat, almost like Harry Potter’s friend Neville Longbottom when his remembral turns red but still leaves him firmly in the dark as to what it is he has forgotten. Similarly, the pangolin, despite its heady status as the world’s most trafficked animal, remains a fairly unknown creature to most of us. What is a pangolin? There are eight species of pangolin in the world, with four being found on the African continent, and they occupy their own taxonomic order, Pholidata. Also known as scaly anteaters, they are descended from carnivores and feed exclusively on a diet of ants and termites. They have no teeth, incredibly long sticky tongues, and ears that seal up to prevent those creepy crawlies getting inside! The name pangolin derives from the animal’s Malaysian name ‘peng-goling’ which means ‘the roller’. Pangolins are covered in tough keratin scales which act very much like armour. If they encounter any danger their first reaction is to roll into a ball with their scales creating impenetrable exterior sphere which they maintain until the danger has passed. Are there pangolins at Garonga? 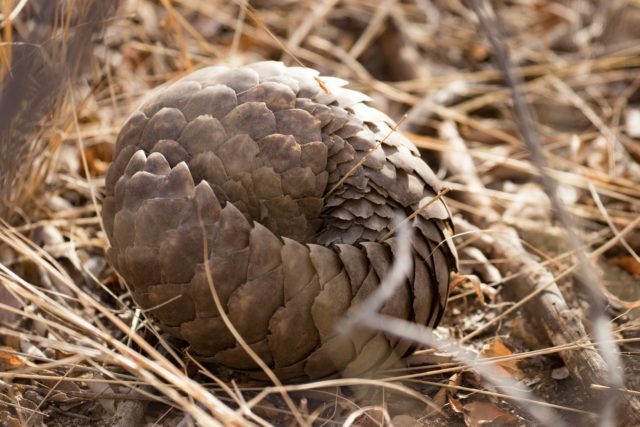 There is only species of pangolin in South Africa, the Temminck’s ground pangolin or Smutsia temmickii if you want to get technical about it. Garonga has a pretty good record as far as pangolins go. We are fortunate to confirm that there are a minimum of three resident pangolins on the property. 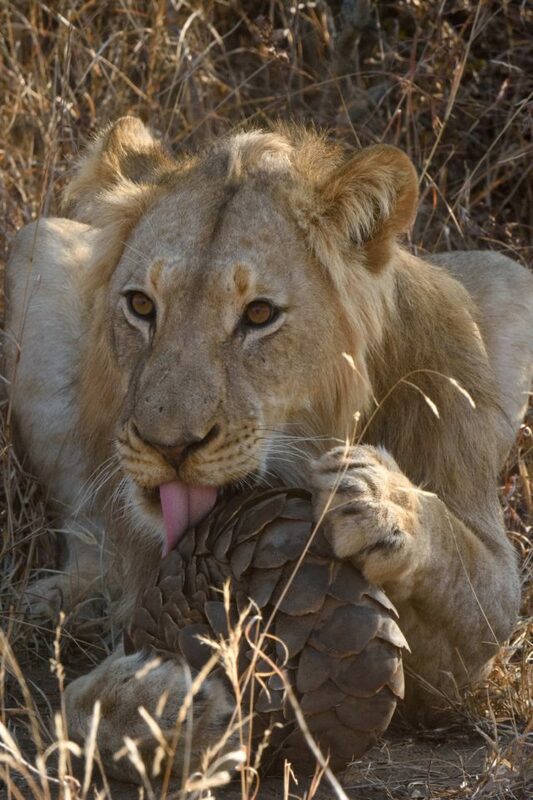 So you can imagine my excitement when I started working at Garonga in June 2018 and went twice daily on games drives, being wholly convinced that I was on my way to see my first ever pangolin. At the start of each drive my tracker and I would confidently announce that we were on our way to find ourselves a pangolin; although I have a sneaking suspicion some of the tracking team might have been humouring me! Yet slowly the days turned into weeks, the weeks into months and, sadly, we had yet to see this elusive animal. This is not necessarily surprising as pangolins are the proverbial pot of gold at the end of the guide’s rainbow. They are infamously tricky to find; there are guides who have spent 20 years working in the bush having never seen this shy and retiring creature. 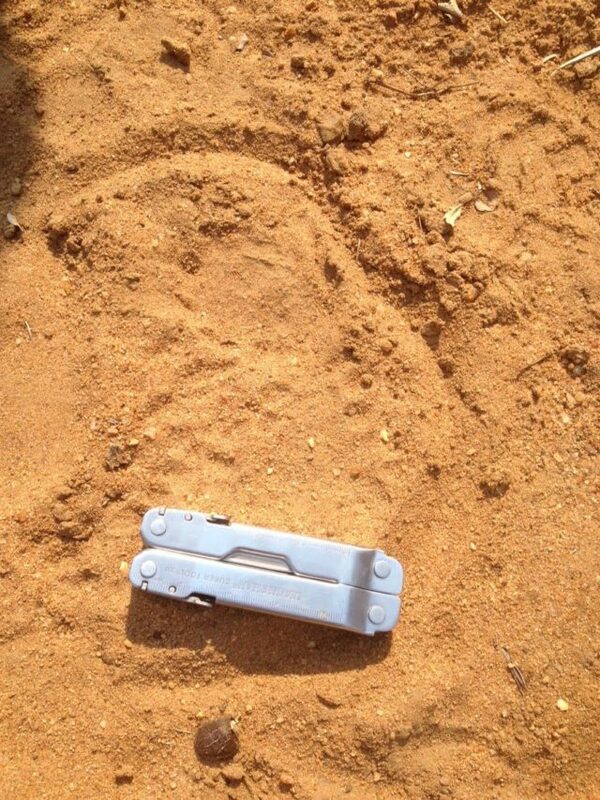 So when Bongi and I were chasing around after a leopard at the beginning of last October and came across fresh pangolin tracks the excitement was palpable. Well, at least it was for Bongi and I, as the guests’ expressions seemed to suggest they were hoping that after a 10-minute hike through the bush for something a little more showy than a fairly nondescript squashed circle in the red African dust. For those of you who haven’t had the pleasure, Bongi is a member of our tracking team known affectionately as ‘The Man with the Magical Eyes’. So, on another afternoon drive in late October, when Bongi called out “What’s that?”, I chuckled and pulled out my binoculars; if Bongi couldn’t identify whatever it was without them, I certainly wasn’t going to be able to. I asked Bongi where we were looking and started a casual scan of the area. On the tracker seat ahead of me, Bongi began to squint and muttered ‘pangolin’. At that point, I was doing a passable impression of a spinning top – binos firmly glued to my face, calling out “Where are we looking?!”. Then my scan took me to my right where I saw it, or more accurately them. That’s right folks, our first pangolin sighting was also our second pangolin sighting. Right before our eyes was a female carrying her youngster on her back. Chaos followed! The guests on my vehicle were French and had never heard of pangolins and in the excitement they got a mixed babble of French and English explanations about how incredible and rare it is to see a pangolin. Bongi and I were close to tears. We followed the female with her youngster in the vehicle for a short way and then got out on foot for a closer look. The adult pangolin headed towards a thick clump of grass, tipped her baby off her back and gave us the enormous privilege of sitting with her and her offspring, taking in their presence and sharing in their story. 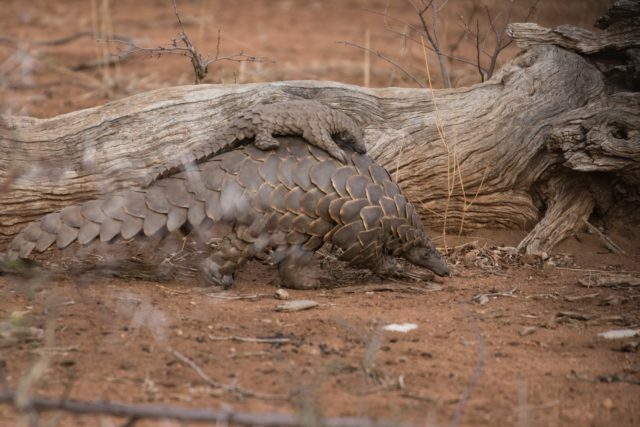 I then got to make, hands down, the coolest radio call in my career “Stations, Sophie is on lock with a mother and baby pangolin – visual 5 out 5”. The radio nearly exploded and there wasn’t a mobile vehicle on the reserve that night that didn’t come to Garonga to see these mythical beasts. Following an inspection of the scales on the female, we noticed a damaged scale and realised, with mounting excitement, that this was the self-same individual that Sam, another guide at Garonga, had seen the previous year who had been in the perilous situation of being curled tightly in a ball clasped between the claws of one of the younger, more curious, Garonga pride male lions! These animals really are amazingly tough as not only had she emerged relatively unscathed from the encounter she found herself a mate and successfully given birth to a healthy baby. The morning after our encounter there was a suspicious number of vehicles circling that part of the reserve but of mother and baby there was no sign – they had vanished. 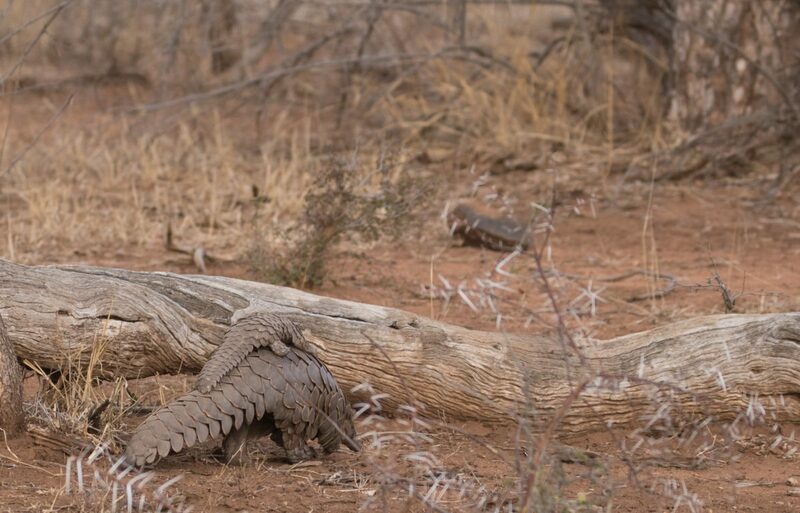 Seeing a mother pangolin with a baby in the wild was such an amazing privilege especially bearing in mind how much pressure is being exerted on this species. It is estimated that more than 1 million pangolins have been taken from the wild in the last decade alone. It took until the week before Christmas until we found their tracks again. Why are they so endangered? Regrettably, pangolins are highly desired for medicinal use both in Africa and internationally. Across Africa, traditional healers use pangolin parts in their treatments, tending to focus on using scales and bones, whilst the meat is used for preparing charms for chiefs or tribal leaders. 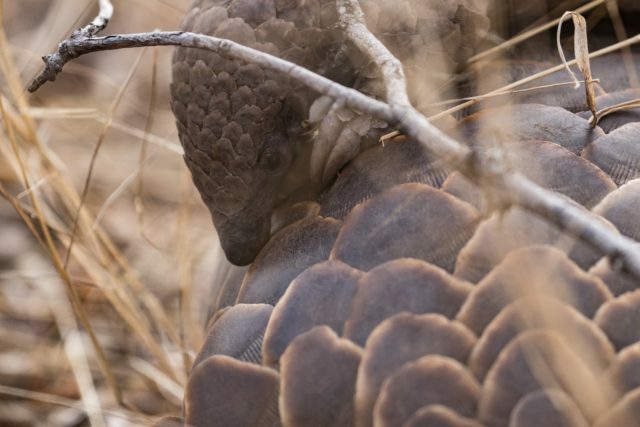 With 80% of Africa’s population relying on traditional medicine either due to not having access to modern medicine or not trusting it, there is a significant impact on the pangolin population. Pangolins are a firm favourite in Asian traditional medicine, to such an extent that the two species of pangolin native to China and Vietnam are now listed as critically endangered on the IUCN Red List of Threatened Species. In Vietnam, pangolins are considered a great delicacy and are smuggled alive into restaurants and then killed at the table to prove their freshness before being cooked and eaten. Unfortunately, despite the impact on their native pangolin populations, the demand both for the traditional Chinese remedies, and for the pangolin as a delicacy continues. 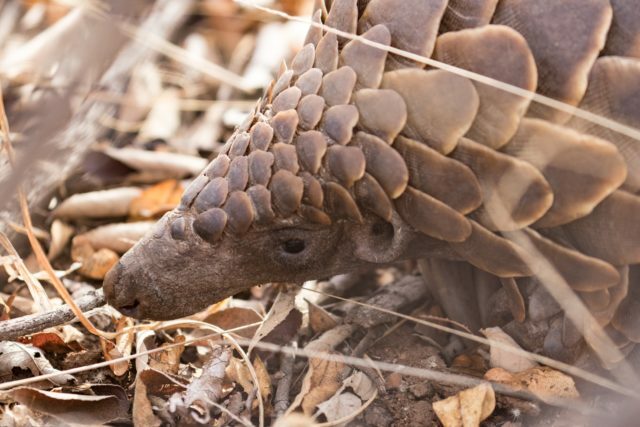 Much of this demand is being met by poaching and smuggling of African pangolin species. 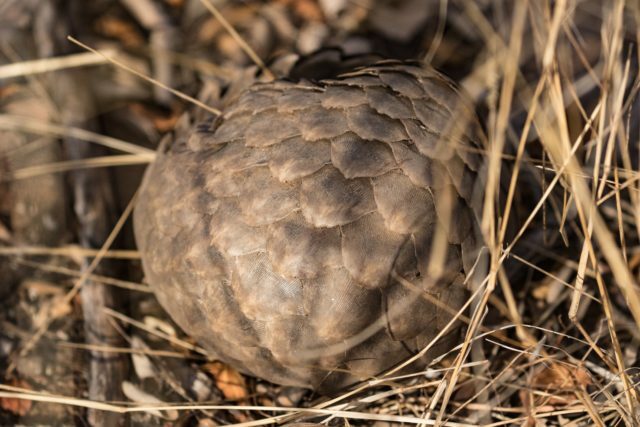 Professor Ray Jansen, an ecologist at Tswane University, says that ground pangolins are currently being poached at 10 times the rate of rhinos. Pangolins are very tricky to raise and keep in captivity as they require constant care and, according to some sources, hours of walks daily are necessary just to trigger their digestive juices. This means that to meet the demands described above, the only source of pangolins is from the wild. 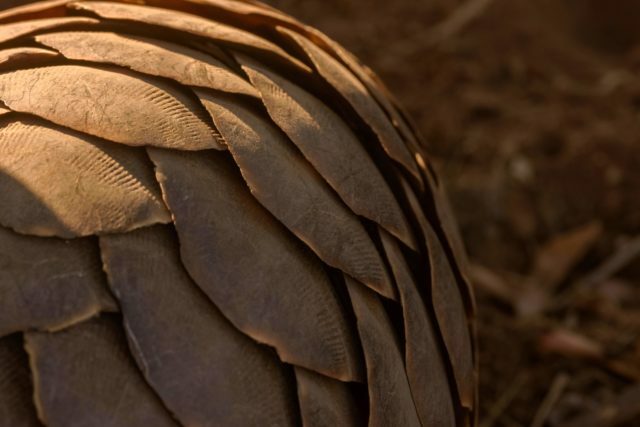 Pangolin scales are made of keratin, which is the same substance that makes up our hair and fingernails and, of course, the heavily poached rhino horn. Science has been thoroughly unable to demonstrate any medicinal value in keratin, and certainly not for the myriad treatments for which pangolin parts are prescribed. Studies have, in fact, shown that over-consumption of pangolin scales can lead to liver problems. It is unclear whether the same is true for over-consumption of human fingernails – I suspect it’s been difficult to find willing participants for the latter study! What can we do to help? First, we must spread the word. People can’t save an animal they’ve never heard of so education is key to the future of the pangolin. The sooner we can win communities over to modern medicine alternatives the sooner we will have a chance at stopping pangolin poaching. Secondly, there are organisations that are already doing great work to help pangolins and, as is often the case with conservation, funding can be scarce and they must turn to the public for support. Rhino Revolution is a great local charity that opened a pangolin rehabilitation centre in August last year, which was in addition to the existing rhino rescue rehabilitation centre. Since opening the charity, they have received a stunning nine pangolins that were confiscated from poachers, three of whom have already been successfully released into the wild. Three of the pangolins were very sick when they reached the team and continue to need round-the-clock care. The work done by Rhino Revolution is vital if we are to see the survival of these incredible animals. If you wish to support their work, then please click here to donate from South Africa or anywhere globally – aside from the UK or the Middle East – and here to donate from the UK or the Middle East. They say old habits die hard and I still find myself leaving the lodge on game drives convinced that this is the drive where we spy a pangolin again. I’m crossing fingers that I’ll have another tale to add to our safari camp stories series.